Alice Zhou '17. Photo courtesy of Wellesley Blue. Track and Field athlete Alice Zhou ’17 has been competing since her freshman year of high school. However, it wasn’t until she attended Wellesley that she began to seriously compete. 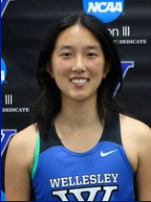 At Wellesley she competes in 5k and 10k events and attends approximately 15 meets per year, including cross country and indoor track meets. This season Zhou has was recorded as the ‘college best’ in the indoor 5000 meter race. She has also been ‘college best’ in the 2016 outdoor 1500 meter race. She placed first in the 5000 meter race at The Regis Spring Classic-2017 meet this season. Throughout her career she has placed in several other meets since 2014. When asked what her favorite event to compete in was Zhou responded, “The 10k–I tend to enjoy longer races because you have time to settle into a nice rhythm”. Although she has not been a leader on the team officially, she hopes that there are times in her athletic career that she has, “led by example.” As an outgoing senior on the team, Zhou advises incoming athletes to not be too hard on themselves as they adjust to college athletics and competitions. “Don’t be discouraged if your success in high school doesn’t carry over immediately to the collegiate level; there’s a pretty significant transition involved that takes a few seasons to adjust to. Just remember that you have years to go, and that patience and a long view of things are never bad to have,” advises Zhou. Throughout her time at Wellesley, Zhou has had to learn how to balance school, a social life and athletics. She admits that since she is in season all year, it was difficult to manage time. However, it became easier with practice. “Like many of my teammates, I’m in season for the entire year, this includes keeping volume up over the summer. The time management is something I got used to pretty quickly, but the lack of downtime can sometimes be tough and lead to physical or mental burnout,” said Zhou. Outside of Track and Field, Zhou enjoys reading, baking and watching documentaries. In the coming years Zhou plans to get a masters degree and research environmental remediation. “I’d like to use my background in chemistry to approach the problem of environmental remediation,” said Zhou.